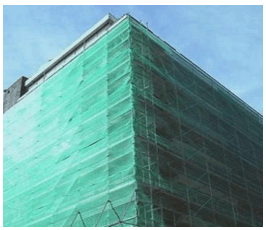 Scaffolding Nets always severe as protection in construction-either as scaffolding nets against weather and failing debris, as shading nets against too much solar radiation, as textile fences to screen off unwanted observers or to prevent floor heating tubes from emerging while being covered with wet cement. In modern construction roof berries with reinforced mesh allow diffusion and therefore sustain an advantageous climate. 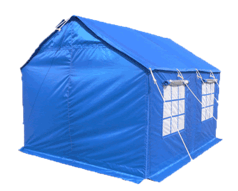 A tarpaulin or tarp is a large sheet of strong, flexible, water resistant or waterproof material. Traditionally tarpaulins were made out of cotton however currently nylon and polyester fibre fabrics are being increasingly used in manufacturing tarpaulins. Tarpaulin is widely used for rain water protection in sheds, transportation - trucks & other automobiles, storage godowns, boats, snowmobiles, construction sites, lumber, grain storage, temporary storages, tents, ground-sheets, etc. Tarpaulins are sheets made out of polyethylene, cotton canvas, jute, etc. Polyethylene tarpaulin is also known as HDPE Tarpaulin, Laminated Tarpaulin, Plastic Tarpaulin, etc. Traditionally, cotton canvas had been the more common form of tarpaulins, but, lately, HDPE woven and laminated fabric and polyethylene sheets have replaced canvas in many of the applications. Hoardings / Signages are made of a translucent flexible textile substrate called flexible-face sign fabric. Flexible-face sign fabric, also known as flex was developed as an alternative to rigid-faced substrates like acrylic, plastic and polycarbonates. Besides hoardings, this material has applications in light boxes, exhibits, trade show displays and majority of other static out of home (OOH) advertising. Flex is made of a PVC coated polyester warp knitted fabric. The fabric is made from high tenacity polyester filament yarn of denier ranging from 250 to 500. 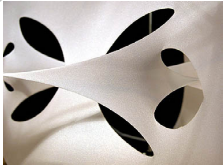 This fabric is coated with PVC and surface treated with lacquer. The material has the properties like Light transmission, Printability, Ultra Violet resistance, Heat sealability, Mildew resistance, Anti wicking. Flex is available in different varieties depending on its application. 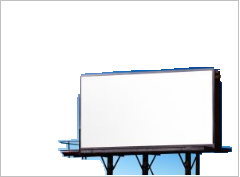 The flex used for front-lit hoardings is available in GSM ranging between 280 and 370 and that for back-lit hoardings is available in GSM ranging from 450 to 650. Architectural membranes are relatively new construction materials being used in India. The applications of architectural membranes include construction of permanent and semi-permanent structures such as car park covers, cafes, walkways, hotels, outdoor entertainment areas, pool surrounds, greenhouses, airports, stadiums, sports halls, exhibitions and display halls, storage bases for industrial and military supplies and any venues that require protection against harsh UV rays, heat, glare, rain and wind. The textile structures used for construction material can be classified into Clear-span structures, Tension structures and Air Structures. Architectural membranes are strong, energy efficient and aesthetically superior products that offer flexibility to designers and architects thus, allowing high levels of creativity. The textile material used for construction purpose is to be made Waterproof , Fire retardant, Resistant to deformation and extension under tension, Impermeable to air and wind, Resistant to abrasion and mechanical damage, Resistant to sunlight and acid rain, Resistant to microbial attack.